Spike Lee's "Do the Right Thing" is the most controversial film of the year, and it only opens today. Thousands of people already have seen it at preview screenings, and everywhere I go, people are discussing it. Some of them are bothered by it; they think it will cause trouble. Others feel the message is confused. Some find it too militant, others find it the work of a middle-class director who is trying to play street-smart. All of those reactions, I think, simply are different ways of avoiding the central fact of this film, which is that it comes closer to reflecting the current state of race relations in America than any other movie of our time. Of course it is confused. Of course it wavers between middle-class values and street values. Of course it is not sure whether it believes in liberal pieties or militancy. Of course some of the characters are sympathetic and others are hateful. And of course some of the likable characters do bad things. Isn't that the way it is in America today? Anyone who walks into this film expecting answers is a dreamer or a fool. But anyone who leaves the movie with more intolerance than they walked in with wasn't paying attention. The movie takes place during one long, hot day in the Bedford-Stuyevesant neighborhood of Brooklyn. But this is not the typical urban cityscape we've seen in countless action movies about violence and guns and drugs. People live here. It's a neighborhood like those city neighborhoods in the urban movies of the Depression: People know one another and accept one another, and although there are problems, there also is a sense of community. The neighborhood is black, but two of the businesses aren't. Sal's Famous Pizzeria has been on the same corner since before the neighborhood changed, and Sal (Danny Aiello) boasts that "these people have grown up on my pizza." And in a nearby storefront that had been boarded up for years, a Korean family has opened a fruit and vegetable stand. Nobody seems to quite know the Koreans, but Sal and his sons are neighborhood fixtures: They know everybody, and everybody knows them. Sal is a tough, no-nonsense guy who basically wants to get along and tend to business. One of his sons is a vocal racist - in private, of course. The other is more open toward blacks. Sal's ambassador to the community is a likable local youth named Mookie (Spike Lee), who delivers pizzas and also acts as a messenger of news and gossip. Mookie is good at his job, but his heart isn't in it; he knows there's no future in delivering pizzas. We meet other people in the neighborhood. There are Da Mayor (Ossie Davis), a kind of everyman who knows everybody; Buggin Out (Giancarlo Esposito), a vocal militant; Radio Raheem (Bill Nunn), whose boom box defines his life and provides a musical cocoon to insulate him from the world; Mother Sister (Ruby Dee), who is sort of the neighborhood witch. There are the local disk jockey, whose program provides a running commentary, and a retarded street person who wanders around selling photos of Martin Luther King Jr. and Malcolm X. And then there are three old guys on the corner who comment on developments, slowly and at length. This looks like a good enough neighborhood - like the kind of urban stage the proletarian dramas of the 1930s liked to start with. 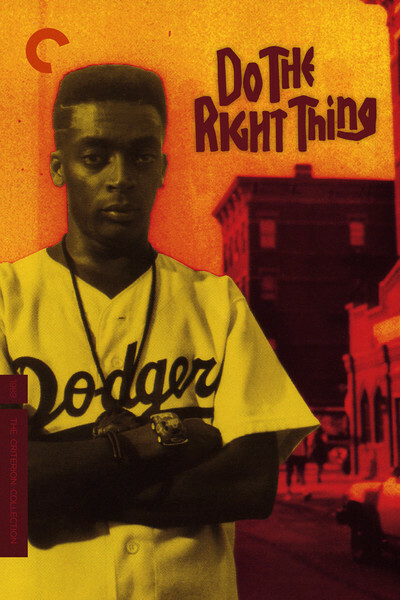 And for a long time during "Do the Right Thing," Lee treats it like a backdrop for a Saroyanesque slice of life. But things are happening under the surface. Tensions are building. Old hurts are being remembered. And finally the movie explodes in racial violence. The exact nature of that violence has been described in many of the articles about the film - including two I wrote after the movie's tumultuous premiere at the Cannes Film Festival - but in this review I think I will not outline the actual events. At Cannes, I walked into the movie cold, and its ending had a shattering effect precisely because I was not expecting it. There will be time, in the extended discussions this movie will inspire, to discuss in detail who does what and why. But for now I would like you to have the experience for yourself, and think about it for yourself. Since Lee does not tell you what to think about it, and deliberately provides surprising twists for some of the characters, this movie is more open-ended than most. It requires you to decide what you think about it. "Do the Right Thing" is not filled with brotherly love, but it is not filled with hate, either. It comes out of a weary, urban cynicism that has settled down around us in recent years. The good feelings and many of the hopes of the 1960s have evaporated, and today it no longer would be accurate to make a movie about how the races in American are all going to love one another. I wish we could see such love, but instead we have deepening class divisions in which the middle classes of all races flee from what's happening in the inner city, while a series of national administrations provides no hope for the poor. "Do the Right Thing" tells an honest, unsentimental story about those who are left behind. It is a very well-made film, beautifully photographed by Ernest Dickerson and well-acted by an ensemble cast. Aiello has the pivotal role, as Sal, and he suggests all of the difficult nuances of his situation. In the movie's final scene, Sal's conversation with Mookie holds out little hope, but it holds out at least the possibility that something has been learned from the tragedy, and the way Aiello plays this scene is quietly brilliant. Lee's writing and direction are masterful throughout the movie; he knows exactly where he is taking us, and how to get there, but he holds his cards close to his heart, and so the movie is hard to predict, hard to anticipate. After we get to the end, however, we understand how, and why, everything has happened. Some of the advance articles about this movie have suggested that it is an incitement to racial violence. Those articles say more about their authors than about the movie. I believe that any good-hearted person, white or black, will come out of this movie with sympathy for all of the characters. Lee does not ask us to forgive them, or even to understand everything they do, but he wants us to identify with their fears and frustrations. "Do the Right Thing" doesn't ask its audiences to choose sides; it is scrupulously fair to both sides, in a story where it is our society itself that is not fair.